In some cultures, they are the predators of the night, hunting and stalking our darkest nightmares. In others, they are noble warriors, great leaders, and protectors of the innocent. With such a varied reputation, it seems that the Wolf is one of the most misunderstood beings in ancient folklore. Wolfs have a special place in our hearts, mainly because they are the ancestors of man's best friend, the Dog. They are also closely linked to another creature that has earned our admiration and respect, the coyote. The word 'wolf' is born from Germanic paganism tradition and comes to us from the Proto-Germanic word 'wulfaz'. In this ancient cultural context, wolves were seen as fierce and fearless warriors, as well as natural predators, thanks in part to mankind's immense fear of these beasts. As such, many Anglo-Saxon Kings and warriors, in an effort to channel their inner wolves, often used the word as a suffix or prefix to their own names. This is why names like 'Wolfgang', 'Wulfsbane', and 'Wulfmeer' are still common names in some parts of Europe, in particular, Germany. But why are these innocent animals the stuff of nightmares? Our fear of these mysterious animals started long before the ancient Greek historians and poets like Herodotus and Virgil, cooked up stories about a race of people who transformed into wolves once a year, thus giving rise to the legend of the werewolf long before Jacob invaded our hearts in the Twilight series. Since the dawn of human civilization, we've always feared things that prow the night. The Wolf, known for its killer hunting skills and unnerving nightly howl at the Moon was one of the predators that our ancestors feared the most. This fear, although engendered by a genuine push for survival during the days of the caveman, became passed on through the generations. The wild stories about the untameable, undefeatable wolf haunted our psyche and soon the animal earned a fearsome reputation. Nowhere is this truer than in ancient Finland, where a long history of bad blood between the Finns and wolves has led to massive extermination campaigns throughout the country's history. In medieval times, wolves were seen as instruments of the Devil. Like many prominent figures of the ancient pagan religions, the Wolf fell prey to the spread of Christianity in Europe and was demonized. This threat, along with our instinctual fear of these animals, helped to give the Wolf a bad reputation in human society. In much of Europe and the Old World, stories of the Big Bad Wolf became an integral part of our identity as myths and legends were passed along in the form of children's fairy tales. Even today, most cartoons and children's series play with this concept. Nine times out of ten, characters with wolf-like qualities are seen as being bad or evil tricksters and no-good scoundrels. Thankfully, in recent times, there have been several children's book authors who have tried to shake off the Wolf's undeserved reputation with books like "The Wolf who cried 'Boy`" and similar titles. The stories of the Big Bad Wolf may also have other cultural origins. In Babylon, the goddess, Ishtar, was rumoured to have turned her former lover - who was a Sheppard - into a wolf, thus forcing him to prey on the very animals that he swore to protect. According to some Christian traditions, wolves are beings sent by God to punish the wicked and test the faith of believers. But the Wolf hasn't always had such a bad reputation. In Roman mythology, the heart of the ancient civilized world, Rome, would not have been founded if it wasn't for the efforts of a young she-wolf who nurtured the fathers of the city, Romulus and Remus. In much of Scotland and the British Isles, the Wolf was seen as a guardian and protector. These animals became intrinsically linked with Fairies and Pixies, as local legends speak of the Green Wolf of the Fairy world that kept a watchful eye on his fairy charges by ensuring that they were always fed. Even from as far back as the days of ancient Egypt, the Wolf held an honorary position as a protector and guardian. The god of Death, Anubis, was often depicted with the head of a wolf or a jackal and charged with the duty of protecting the souls of the dead in the afterlife. Anubis ensured that dead ancestors would get safe passage through the Realm of the Dead. In Mexico, this belief was also prominent in ancient traditions. Mesoamerican cultures sometimes buried a wolf with a human sacrifice to ensure that the person had safe passage to the Afterlife. The Wolf's incredible hunting skills have earned the respect of the world's most elite soldiers. It is not uncommon for military and paramilitary groups to identify with the powerful and fearless wolf that seeks out and destroys its enemies with precision and speed. From the Serbs to the British, everyone has a deep admiration for the killer wolf. 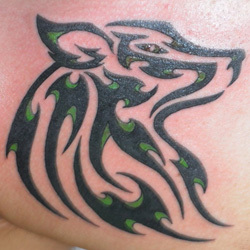 As such, the image of a prowling wolf is a common feature in Heraldry. By far, no other culture has honoured and respected the noble Wolf for his exemplary character like the Native Americans. In countless tribes across North America and Mexico, the Wolf is seen not only as a totem of power and strength, but also as a pillar of wisdom and a spiritual guide. From the frozen shores of Alaska to the sweltering heat of the deserts, Native Americans believe that the Wolf is much more than just a wild animal. For the Pawnee people of the Great Plains, the Wolf was the first creature to understand and experience death, as such, the animal is a totem for the Afterlife. Pawnee folklore states that the Wolf Star, Sirius (which is also known as the Dog Star, but considering that wolves are the ancestors of dogs, then this association is understandable), was placed in the sky to remind the people that they were the ones who brought Death into this world and to show the Wolf on its nightly journey to and from the Afterlife (the Wolf Road). Wolves are exemplary parents, so it's no surprise that they are symbolic of Family in Native American cultures. Wolves mate for life, are doting parents, and in the Wolf's world, "it takes a pack to raise a cub". The pack always sticks together, no matter what the circumstance may be. As such, they are also known as loyal companions and friends. Wolves are also known to be extremely communicative. The image of a wolf howling at the Moon is symbolic of its ability to express its control over a region or to call its pack members to a meeting and has become the one of the quintessential images of life in the Wild West. But its howl isn't the only communication tool that a wolf has; it uses its body language to convey a variety of feelings, including fright, aggression, sympathy, and even affection for its pack members. Wolves nuzzle each other regularly and aren't afraid to show some level of affection for their fellow pack members. Of all the related members of the wolf family (jackal and coyote), the Wolf is believed to be the most expressive, using its olfactory, auditory, and visual senses to show a range of complex emotions and communication signals. It is this type of behaviour that makes our little Fido so lovable; he can show a range of emotions and social behaviours that he has inherited from his grandfather, the Wolf. In Chechen tradition, the Wolf is more than a wild animal; it is a symbol of national pride. They believe in the Wolf Mother and see her as the nourishing and protective force that has shielded their people from strife and worry. To be as "free and equal as a wolf" is one of the greatest honors that can be achieved by anyone. Even our language has been influenced by the Wolf. If you haven't had a decent meal for ages, you'll 'wolf down' your next plate with ease and being a 'Lone Wolf' means that you prefer to find your own path and stay away from the confusion of the crowd. A Lone Wolf isn't herded around like mindless sheep; you are fierce and driven by your own motivations. Of course, everyone knows never to trust a deceitful 'wolf in sheep's clothing'. Given the Wolf's colourful history, it's easy to see why we simultaneously love and fear them. They are doting parents, loyal companions, friends, guides, protectors, and wise leaders, as well as vicious killers. This only goes to show you that there are two sides to every coin and that being a "wolf personality" isn't necessarily a bad thing. 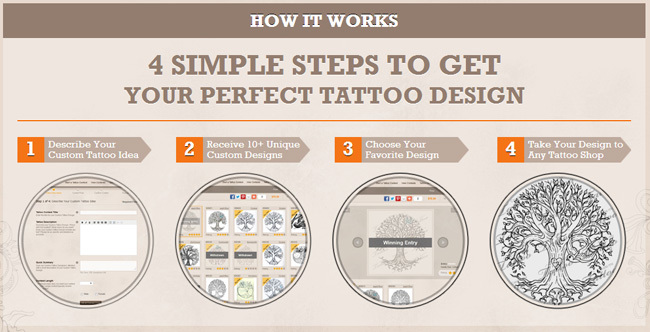 These tattoo designs can be as varied and interesting as your imagination allows. For the most part, people tend to connect the tougher side of the Wolf and see themselves as fierce warriors or Lone Wolves. For these designs, it's best to place them over major muscle groups to make your wolf appear more menacing with each twitch. Wolves play an important role in the Celtic Tradition. Wolves were guardians and protectors of the forest spirits and they ensured that the Faerie Realm remained secure from outside influences. These majestic animals were seen as symbols of the Moon, thus, by extension, as Femininity. Scottish legends speak of the Green Wolf who often provided food for the fairies by telling nursing mothers to provide milk for them. In this tradition, wolves were the bringers of the night; without them to hunt and eat the Sun at twilight, the Moon would never rise each night. 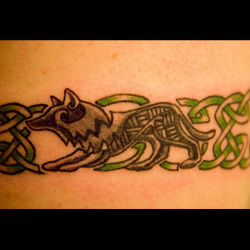 A Celtic wolf tattoo represents not only your bond with the ancient ways of these noble people, but is also a great way to tip your hat to the Wolf in acknowledgement of her guidance and protection. These designs also evoke power and strength, after all, only powerful being could devour the Sun. A skull is a symbol of Death, man's Mortality, and Destruction. Wolves have long been attached to the Afterlife. In ancient Egypt, the god of Death, Anubis, was often pictured with the head of a wolf or a jackal (depending on your point of view). Wolves are spiritual guides in the Afterlife in many Native American and European traditions. 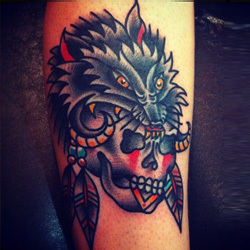 A Wolf skull tattoo symbolizes your understanding of Death and, in a sense, you are calling on the Wolf to be your guide. You are fearless in the face of your Death, like the powerful wolf. The eyes are the windows to your soul; it is through these powerful organs that we perceive the world around us and gain an understanding of how things work. The Wolf is an animal known for being expressive and highly communicative. It sees beyond things beyond the surface and uses every sense, eyes, ears, mouth, and skin, to interact with the world around it. In the wild, the Wolf keeps its gaze fixed on its target and some persons have even gone as far as to say that the Wolf's gaze seems to penetrate their very being. 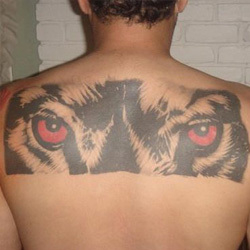 Wolf Eyes Tattoos symbolize your deep understanding of the world around you and shows that you perceive more than what's on the surface of things. Paw prints symbolize movement and Progress. Such a tattoo shows that you aren't stagnant in your life and is a tip of the hat to your desire to evolve emotionally, personally, professionally, and spiritually. 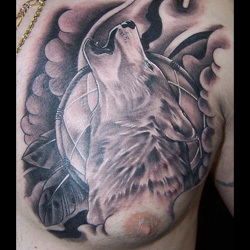 Additionally, in many Native American traditions, the Wolf is a spiritual guide, guardian, and protector. In Mexico, wolves were buried with human sacrifices in a symbolic gesture of guardianship and guidance of the deceased through the Afterlife. 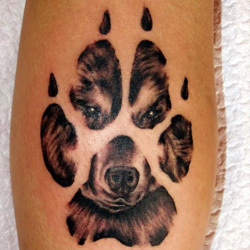 In a sense, a Wolf Paw Tattoo is a way to show that you are progressing through your journey in life under the watchful eye of the Wolf totem. The Wolf and the Raven are prominent fixtures in Native American lore. On one hand, both are revered for their intelligence and possession of ancient knowledge, but on the other, they are notorious for being sly tricksters, clever survivalists, and adept shape-shifters. The Wolf and the Raven are engaged in a battle of wits; a competition to see who will prevail based on brains. The Raven is a Keeper of Secrets and the Wolf is the Purveyor of Ancient Wisdom. In some stories, one outfoxes the other, whereas in other traditional tales, both combine forces to outwit evil-doers. 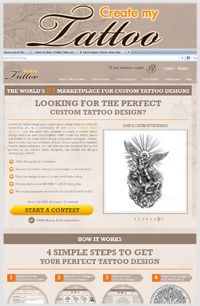 The wolf and raven tattoo hark back to this Native American tradition and show your spiritual connection to the teachings of the native peoples of America. This concept is also seen in European traditions as well, in particularly those with ties to ancient Germanic paganism. 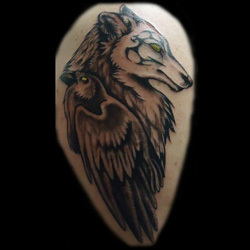 In these traditions, the Wolf, the Raven, and the Eagle are engaged in an endless battle against evil and dark forces. The quintessential image of the Wolf's power is the sight of the animal howling at the Moon. In many European and Native American traditions, wolves are creatures of the Moon which accounts for why werewolves transform only during the full Moon. The Wolf-moon, according to some Native American traditions, is celebrated in January and is symbolic of Transformation. In the Wiccan culture, it is a sign of Birth and Femininity because both totems, in one way or the other, are symbols of Creation (Wolf is an emblem of Family and Community, whereas the Moon is an ancient sign of the Feminine Divine). The Moon and the Wolf are also signs of Communication and Power. An alpha wolf is usually the only one that howls at the Moon and it does so to signal to the rest of its pack that there is a gathering and to let non-pack members know that this is his territory. 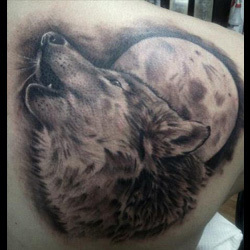 Moon and Wolf Tattoos represent Power, Transformation, and Femininity. Throughout history, it isn't uncommon for indigenous peoples to decorate their bodies with markings meant to evoke the ancient spirits. By doing so, they have infused themselves with the power of the ancestors and the gods, thereby enabling them to do things mere mortals are not capable of. 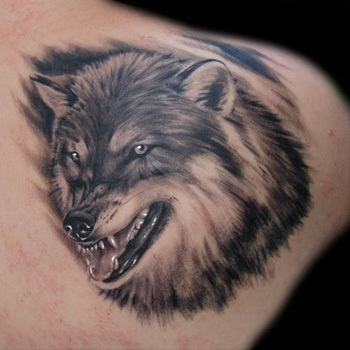 Tribal wolf tattoos are common patterns for Native American warriors who identify with the power and fierce fighting spirit of the noble Wolf. 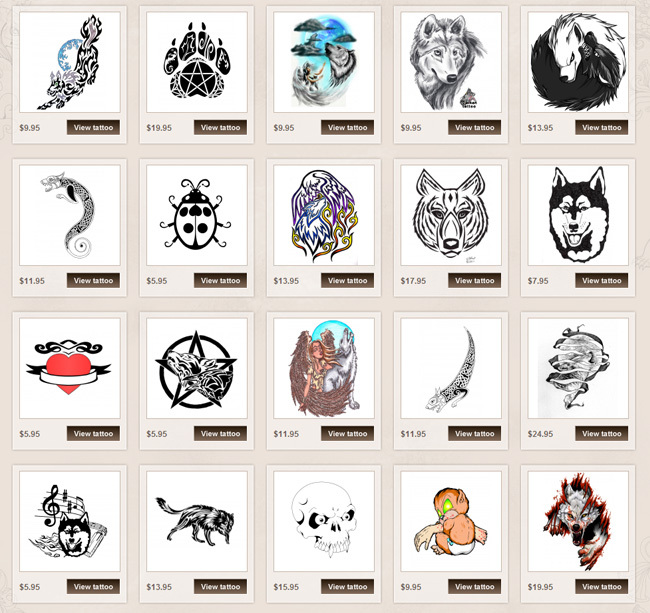 These designs not only identify persons as members of a particular tribe, but also infuse them with the spiritual power and energy of the Wolf. Wolf warriors are primal, powerful, and fearless in the face of danger. 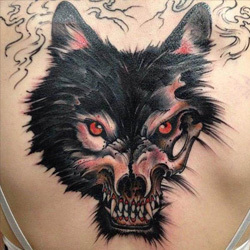 In keeping with the image of the fighting wolf, a Wolf Claw Tattoo symbolizes your fearlessness in an emotional, spiritual, mental, or physical battle. Claws and claw marks in general represent conflict and is a sign of a fierce conflict. 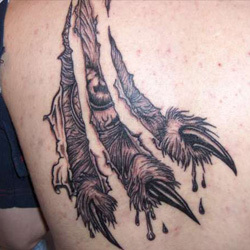 Wolf Claw Tattoos ooze Power and Strength; they are symbolic of your fearless fighting spirit and your ability to completely dominate your foes. 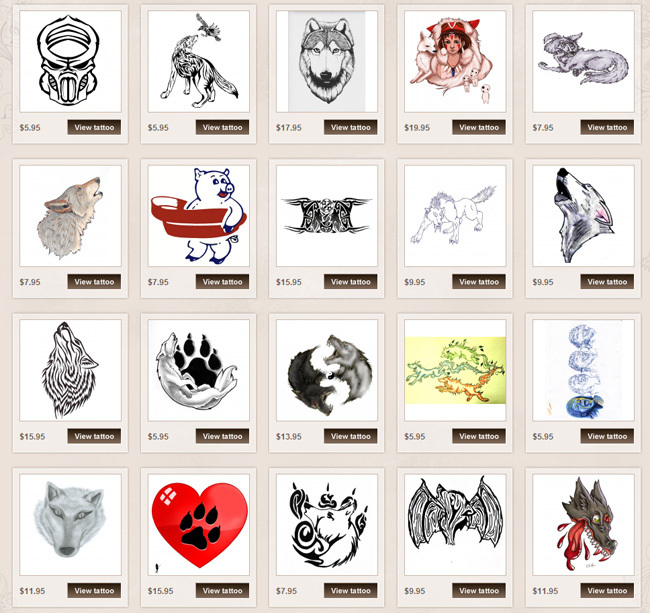 Are you looking for the Perfect Wolf tattoo design? The Wolf is a totem for both sexes. It is a symbol of primal power, dominance, and strength, as well as an emblem of Family and the Feminine Divine. The Wolf is an intelligent guide, a cunning trickster, a wise spiritual leader, and a loyal companion. 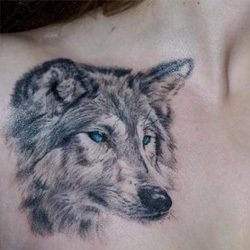 If you see yourself in the eyes of these magnificent creatures, then an intricate tattoo design can channel your inner wolf. 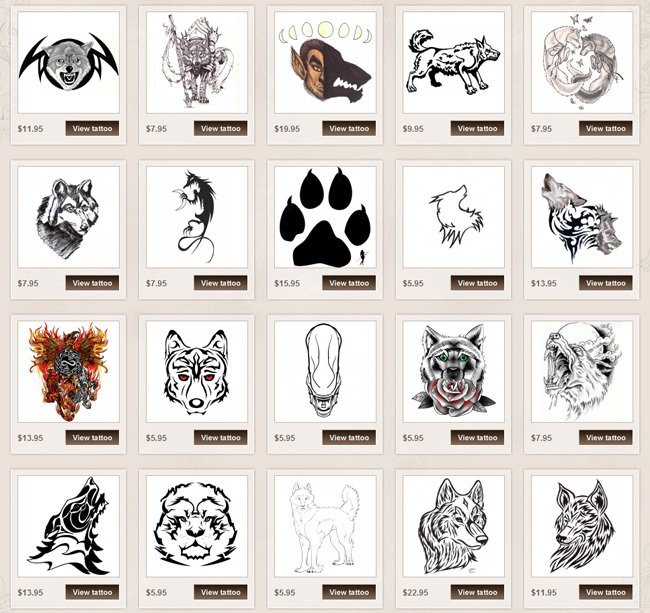 Given these animals' intricate history with mankind, there are a range of symbolic meanings and spiritual concepts on which you can base your design. When it comes to creating the perfect design, the sky is the only limit to your imagination. Regardless of what elements you may add to your piece, think carefully about what the overall meaning of your artwork symbolizes and where your piece will be placed on your body. The best designs can be ruined by poor placement. If you're stuck trying to create a unique piece, then our team is more than happy to help. 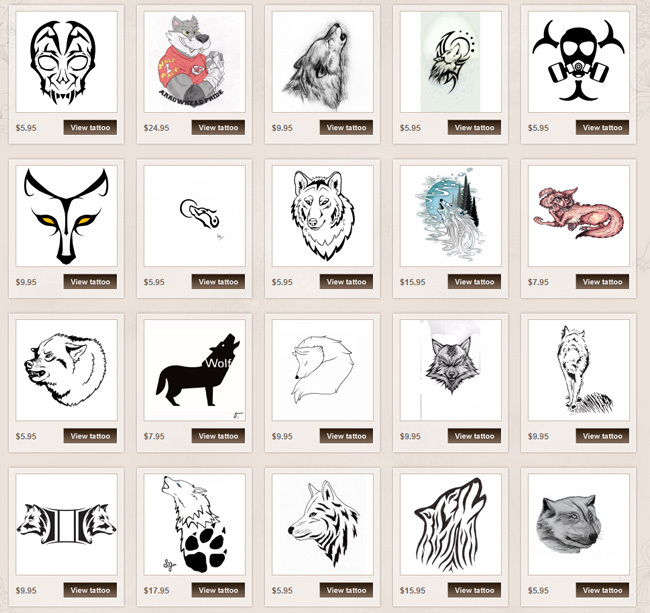 Take advantage of a great custom design service and customize your Wolf Design. 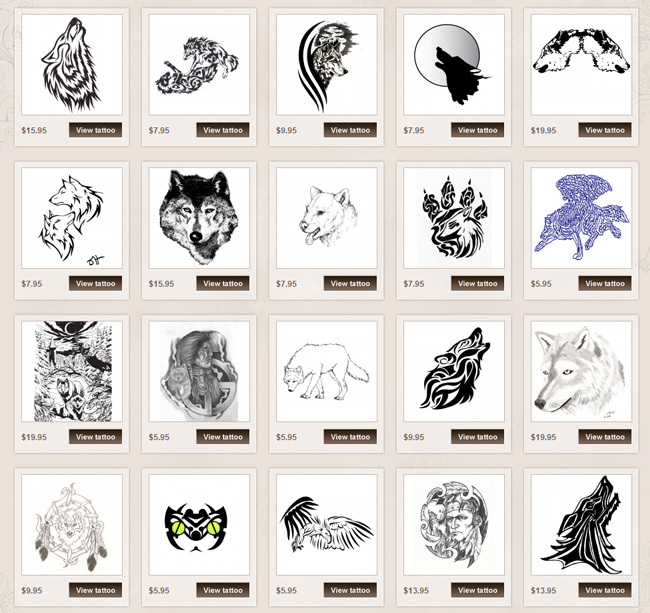 If you already have some general thoughts about your Wolf design (additional elements, shape, size and colors) and where you want to place it on your body, now is the perfect time to let artists from all over the world design a truly unique piece for you.